Adobe has released a beta version of Soundbooth , a scaled-down version of the Audition audio editing suite. So far it is available without charge, and is also available for Mac users. 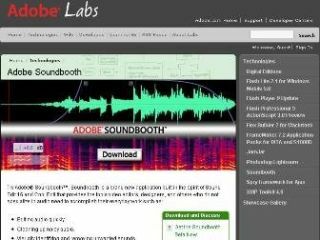 Aimed at home users who can't justify the cost of Audition , Soundbooth is Adobe's attempt to reach those who are not too bothered about the quality of production as Audition users but want to be able to make relatively easy edits. The specifications include a built-in editing suite via a spectrogram (new in Audition 2), which is a useful way to edit out unwanted noise. The interface is built around Audition's but differs from the higher-end program in that it is also available for Mac users. Perhaps this means that Audition is to be available for Macs in the future too?